P.M.: Upon arrival at Bamako airport, you will be met, assisted and transferred to your hotel. Overnight at Hotel. Day 2: Bamako - Ségou. A.M.: After breakfast, we start Bamako city tour - panoramic overview of the city from Point G, the national museum, the city market, the artisans and antiquary village where sculptors, weavers, leather workers, jewelers and metal workers exhibit your wares and skills. P.M.: After Bamako city tour, drive to Ségou at 235 km, check into your hotel, dinner and overnight at your hotel. Day 3: Ségou - Mopti. A.M.: After breakfast, depart Ségou to Mopti, the venice of Mli for its location between Niger and Bani river. Sightseeing many places en route, stop and lunch in San, a Bobo city. P.M.: Arrival Mopti, check into your hotel and dinner at your hotel. Day 4: Mopti - Timbuktu. A.M.: Breakfast then drive via Douentzan to Timbuktu, the legendary city, picnic lunch en route. 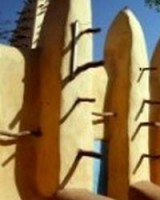 P.M.: Arrival in Timbuktu and visit: the museum, the market, the old districts, the manuscripts etc. Dinner and overnight at your hotel. Day 5: Timbuktu - Mopti. A.M.: Drive back and crooss the unforgiveness Desert to Mopti, picnic lunch. P.M.: Arrival in Mopti, check into your hotel and overnight in Mopti. Day 6: Mopti – Dogon country. A.M.: Breafast then drive to the fascinating Dogon country, stop in Songho, reknown for its rock paintings and circumcision grotto. Picnic lunch. P.M.: Short walking tour of Sangha: the two districts of Sangha named Hogol du Haut and Hogol du bas, the fox table. Dinner and overnight in Sangha. A.M.: Breakfast then continue to visit Dogon villages along the escarpement, lunch in Sangha. P.M.: Drive to Djenné, arrival, dinner and overnight at the campement. Day 8: Djenné - Ségou. A.M.: Breakfast, tour of Djenné, Timbuktu ancient sister city and declared world heritage site by UNESCO. Day 9: Ségou - Bamako. A.M.: After breakfast, visit Ségou - the local brewery, the old city of Sekoro, the fishing port etc…After visit drive to Bamako where we will have our lunch, Free in the afternoon. P.M.: Dinner and overnight in Bamako. Day 10: Bamako - Kaye. A.M.: Breakfast then drive to Kayes, the first administrative region of Mali, picnic lunch en route. P.M.: Upon arrival in Kayes, check into the hotel and overnight at the hotel. A.M.: Breakfast then Kayes city tour ( the market, the train station, Médine where Mali first school was built, the waterfall of Felou, lunch in town. P.M.: Dinner and overnight in Kayes. Day 12: Kaye – Matan. A.M.: Breakfast then drive to cross the border of Mali to Senegal, lunch and sightseeing some malian and Senegalese village en route. P.M.: Upon arrival in Matan, we check into our hotel and stay overnight. Day 13: Matan – Saint Louis. A.M.: Depart to Saint Louis then sightseeing villages en route. P.M.: Upon arrival in Saint Louis dinner and overnight at your hotel. Day 14: Saint Louis – Dakar. A.M.: Breakfast then Saint Louis city tour. Lunch in town. P.M.: Depart to Dakar, upon arrival check into your hotel and stay overnight there. A.M: Dakar city tour: the museum, the market, Gorée Island; have lunch in town. P.M.: Transfer to the airport for home departure. - Taxes in the villages.